Even though we are looking at temperatures in the 90s this week, we went ahead and transplanted the lettuce and radicchio. It would have been too big by next week anyway. First off, we removed those horridly aphid-infested cucumbers from the Family of 4 Garden. We also raked of the straw mulch from any of the areas where we were planning to plant. 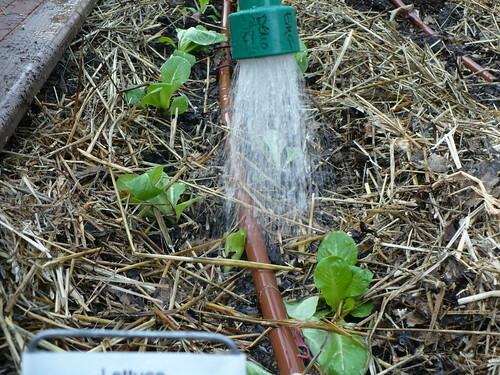 We planted the lettuce right along the drip lines, staggering the plants about 6-8″ apart on either side of the drip. The soil was BONE DRY even after we recorded more than 3″ of rain over the weekend! I’m guessing that unless we have more consistent rainfall this fall (yeah, right), we will probably lose some of these plants, just because the drip doesn’t have enough coverage in this super sandy soil. The emitters on the drip are 12″ apart. 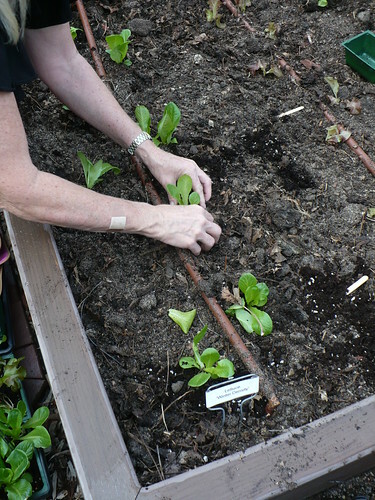 Once we were done planting, we put the straw mulch back in a light layer between the rows of lettuce. Having straw mulch in a lettuce bed isn’t necessarily a great idea, because it can make cleaning the lettuce after harvest a bit of a pain. However, we really wanted the straw to help hold soil moisture and to keep the soil a little bit cooler for the time being. We also made sure we watered thoroughly. 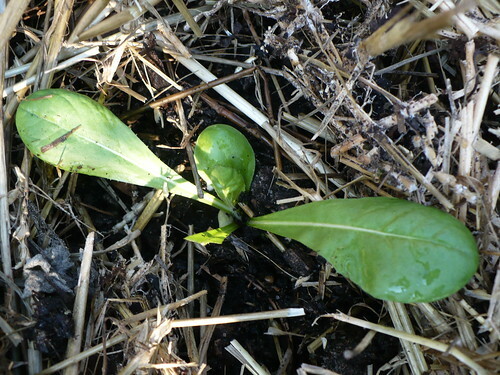 Over in the “New & Unique Vegetables” garden we planted some green and red radicchio seedlings. (They both look green right now. Color development depends on cold weather.) 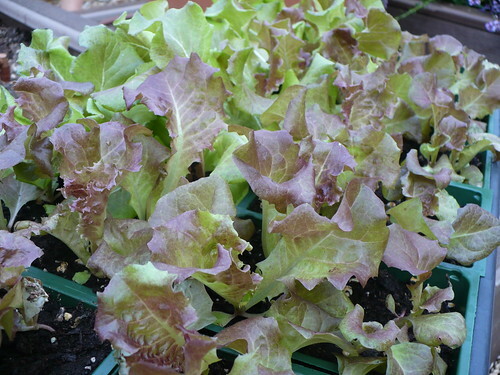 We used the same planting scheme as with the lettuce. We also planted some cilantro in a small area in the Mexican Garden, between the peppers and the Mexican Oregano. The leek and onion seedlings are still pretty small, so we will plant them in a couple weeks when there is more space to plant. 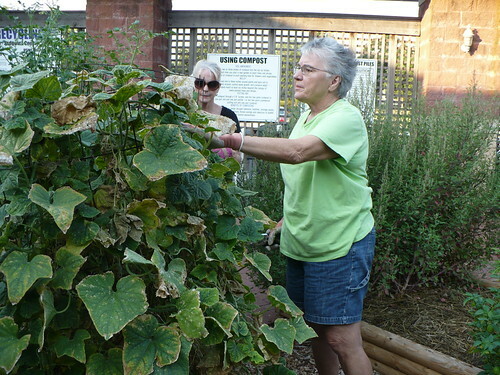 As I mentioned in passing on Tuesday, we have several different things going on with our vining vegetables – cucumbers, squash, etc. 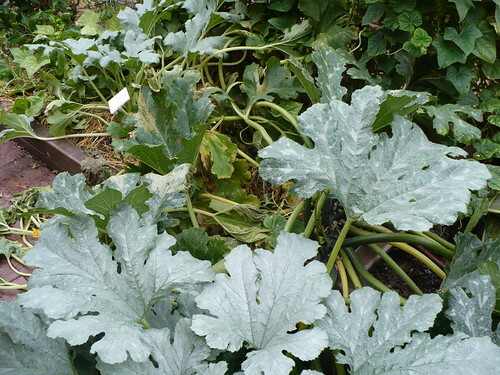 Actually, the melon plants are all still in good shape, so the problems are restricted to the cucumbers and various squashes. 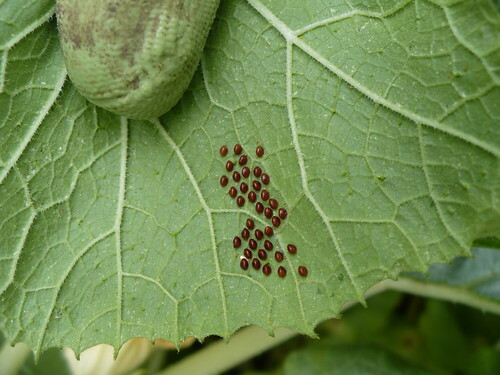 The cucumbers in the Family of 4 Garden are coated with these…any ideas? I’ve seen numerous samples of vine plants come in this month with the same signs and symptoms. I think what tricks folks is all of the white flecks. This is actually a severe aphid infestation. If you look closely, especially in the upper left corner of the picture, you can see the green buggers. In the middle of this picture is an ant…and ants like to “farm” aphids and protect them from predators so the ants can feed on the sticky honeydew that the aphids excrete as they feed. The white flecks? 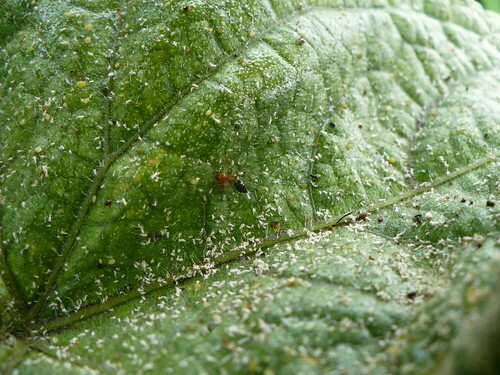 Those are the aphid “skins” as they grow and mature they “molt” and leave those white skins behind. I’m sure there’s a technical term, but I can’t remember off the top of my head. To make matters worse, the cucumbers also have these terrible looking insects on them! Can it get any worse? Well, actually, you might recognize the one as a ladybug, and the black and orange lizard-like bug…that’s the larvae of the ladybug! These are the good guys that are enjoying quite a feast of aphids! So, what are we doing about the aphids on the cucumbers? Well, honestly, the answer is nothing. We’ve gotten quite a bounty of cucumbers, and the plants are still doing pretty well overall. The ladybugs aren’t controlling the aphids at this point, although given a couple of weeks they might get there. 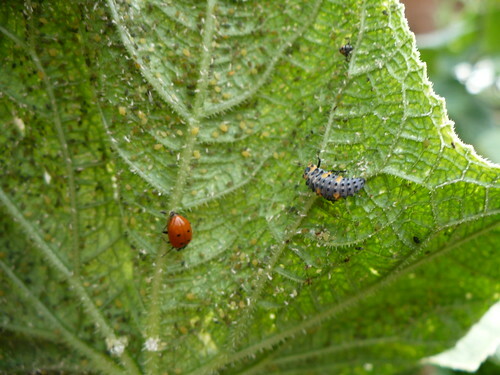 Spraying would kill the ladybugs and may not do much to prolong the life of the cucumber vines. We’ll probably let them go and pull the plants out in a few weeks if they become completely unproductive. Ugh…powdery mildew. This is a disease that we often see on zinnias and other common garden plants about this time of year. Usually you start out seeing round, powdery white spots on the leaves. It seems like most of our squash went from 0 to 60 in almost no time flat, because the leaves are pretty well coated on several different varieties of squash. There are treatment options, but they are most effective as preventatives or very early in the infection period. These plants just aren’t worth saving at this point. Besides, we’re tired of zucchini! There are powdery mildew resistant varieties, but they can still get the disease in a bad year. As you can see, a lot of things are starting to go downhill fast in the garden this year. Luckily we’ve got some seeds started inside and garlic on order for later this fall! Today was an exciting day in the Family of 4 Garden! We actually had some tomatoes to harvest! 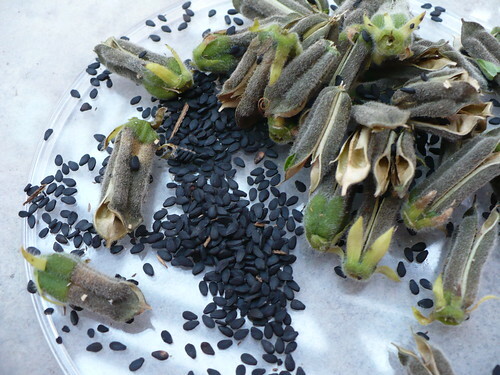 They turned out to be not beautiful – one with a crack and one with a touch of blossom end rot (shock!). But they were still tomatoes. The cucumbers and zucchini are still producing quite well, although we ended up pulling out the zucchini due to powdery mildew. The cucumbers are slowing down quite a bit, probably because they are coated in aphids. I’ll post more about these two occurrences tomorrow or Thursday. Another Tuesday, another Family of 4 Garden harvest! I think that the zucchini and the cucumbers are slowing down a little bit. We also planted some seeds indoors today that will fill in some of the spots in the garden over the next few weeks as we start pulling some plants out. More about that tomorrow! We are slowly but steadily creeping up the chart! 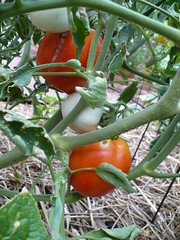 Unfortunately, most of what we are harvesting is coming from the other gardens right now, especially the neat things. I’ll try to get a post up about some of the other things tomorrow or Thursday.